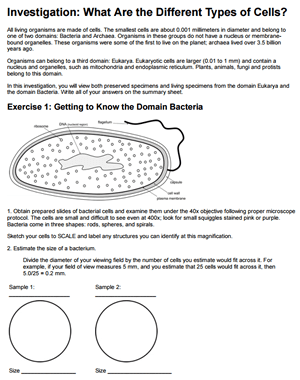 This lab requires students to look at cells from different domains and kingdoms. Students compare the size of cells within the eubacteria domain to the size of eukaryotic cells from the plant and animal kingdoms. Ideally, students will have already completed “Investigation: Microscope” so that they are familiar with making scientific sketches and estimating sizes. This investigation provides a survey of the many basic types of cells the students in biology may encounter. They also compare the cells found in the roots of plants, to cells found in the leaves. Students will create their own slides of their cheek cells and onion cells, but will also have access to preserved slides of protists, like paramecium and euglena. Instructors can modify this lesson dependent upon what resources they have available.